30% Tempranillo, 60% Garnacha (Grenache) and 10% Viura from the Tondonia vineyard. The 1998 is the winery's current release. Look at the beautiful onion skin color! Believe it or not, that is a term used to describe the color of rosé. 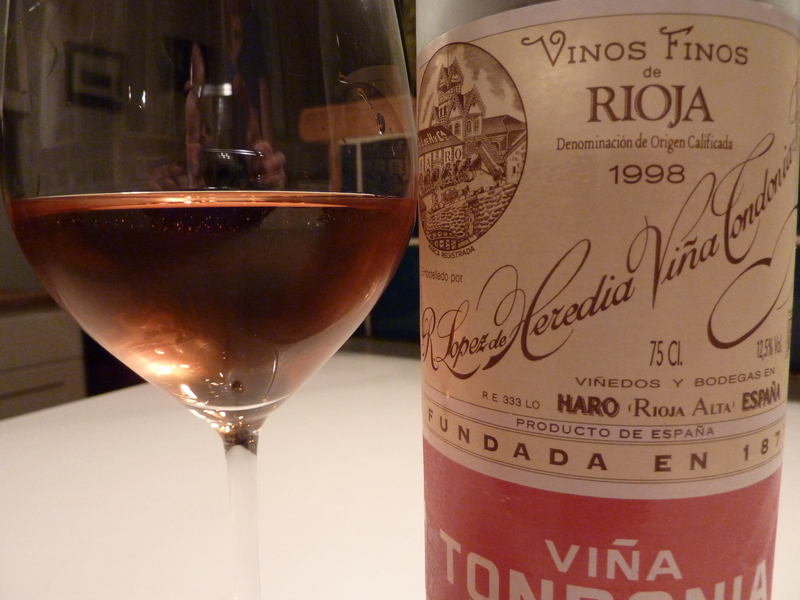 Founded in 1877 and one of the few family-owned estates left in Rioja, López de Heredia is decidedly old-school; only grapes from their own vineyards, no chemicals, no pesticides, natural yeast, no machines (only hand harvesting), no chaptalization, prolonged barrel aging prior to release, 4 barrel-makers on staff, hand-racking with oak funnels, no filtration at bottling, and the list goes on. This rosé was one of the most interesting and exciting I’ve ever had. On the nose were notes of almonds, strawberry jam, orange peel, honey, cardamom and earth, and on the palate some cherry kicked in, along with mouthwatering acidity. The complexity is due, in part, to the 4 1/2 years the wine spent in barrel (it was racked twice per year and fined with egg whites). We paired it with Vietnamese food and it would also stand up to Chinese, Indian and Mexican cuisines. It might be happiest, though, in your picnic basket, alongside some tasty sausage. To top it off, wines from this producer tend to be a great value. I picked this bottle up recently, on sale, at Union Square Wines for $24. Oh, and Eric Asimov likes it, too.